For more than a decade, counterfeit drugs with unreliable ingredients have caused patients suffering by not curing their illnesses. Now, counterfeit drugs with deadly ingredients threaten American lives with just one dose. A closed, secure supply chain is even more imperative when the risk of breakage is death. 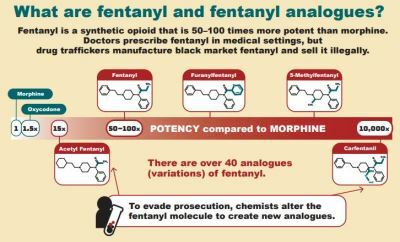 Since 2012, Canadian authorities have been battling an illicit market in counterfeit medications made from fentanyl, a dangerous painkiller 25-40 times stronger than heroin. In their efforts to stop suffering and death, Canadian authorities have shut down over 20 fentanyl labs since 2013. In 2015, U.S. authorities began reporting waves of overdoses and fatalities after residents took counterfeit Xanax or opioids that contained fentanyl or fentanyl analogues. The problem has spread to at least 42 states, and recently, authorities have been seeing pills containing carfentanil, an even more powerful drug used to sedate large animals. The DEA reports that pills containing fentanyl or its analogues are manufactured in Canada or Mexico and smuggled across the border, but they're also made domestically when Americans buy powdered fentanyl and pill presses (often from China) to distribute it themselves. The drugs are so toxic that investigators have to wear HAZMAT suits to avoid exposure.